Search engines today like Google and Yahoo look into Twitter as a resource of real-time results as recommended by users. This makes it important for bloggers who would like their content become widespread to share quality content and interact. This helps increase your network size as you proactively connect online and mingle relevantly with active users. This allows you to manage multiple Twitter accounts. I also added my Facebook fan pages for various websites (rather than Facebook personal profile) for simultaneous update. You can schedule tweets at a later time too. It has statistics that you can use to monitor which of the links you tweeted merited the most number of clicks. It can also promote your latest blog post as you can add RSS feeds. You can use this tool to monitor which of your tweets elicited a retweet and response from followers. You can post follow-up replies from their site too (example). I posted this at the sidebar of my blog with the intent of encouraging readers to check it out and join the discussion if interested without necessarily leaving this blog. You can also come in the morning and try their breakfast. My favorite is the big breakfast. 3. On weekdays, 5 to 8 pm, cocktails are available on a buy 1 + 1 arrangement. For those who are treating clients and are on a budget, this is one great deal to avail of. 4. They serve Kape Isla Philippine coffee that helps local farmers. Kape Isla is a seal given by the Philippine Coffee Board. 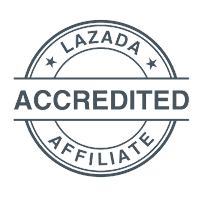 It is a stamp of approval for quality Philippine coffees. 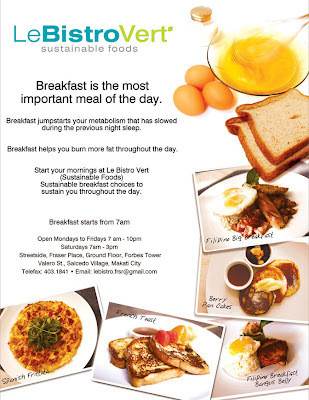 If you haven't tried this yet, visit Le Bistro Vert, Fraser Place, Valero Street, Makati City and have a free cup of Kape Isla Philippine coffee. Just mention the code "KapeIsla164" to avail of it. This offer is valid until March 31, 2010. 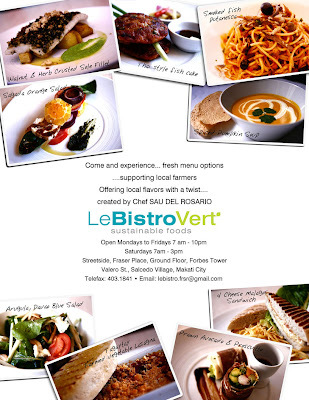 Le Bistro Vert has a function room that can be used for special events or lectures. If you have a large party happening, the whole place can also be reserved to you. Packages are very negotiable. 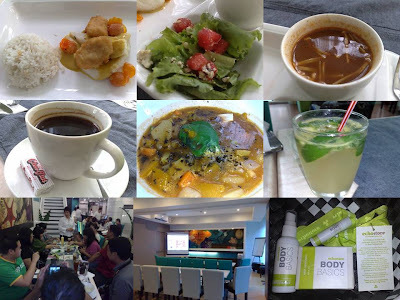 Tried the place last December 2009 for the Blog4Reviews.com Christmas party and our guests enjoyed it. 6. Le Bistro Vert is a social enterprise and include its network of companies conjointly marketing to communicate their sustainability culture consistently. A simple demonstration of this is the use of ECHOstore products in the rest room of the restaurant. ECHOstore daily care and home products represents small marginalized, cultural communities, creative industry practitioners, women groups and foundations. 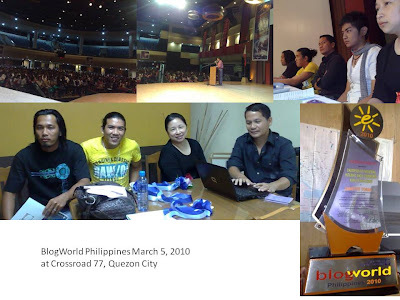 Last March 5, I gave a talk at the BlogWorld Philippines 2010 event that took place at Crossroad 77 in Quezon City. I'm very thankful to DigitalFilipino Club member Asian Institute of E-Commerce President Aveleo Fuentes for inviting me to share insights on blogging. 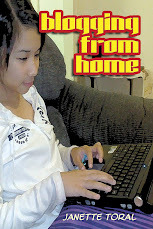 All participants were given a copy of the Blogging from Home book. Check out the tutorial videos and additional learning insights should you like to pursue it further. Identify where you want to be known for. Is this something that you will be interested in doing for the next ten years? Give and share what you know. In the process, you will earn goodwill and trust that can result to opportunities. Don't be a copycat. Know right from the start what will make you different from the rest. Partner with those where you can add value to and benefit from as well. If you'll do the above well, there is a big possibility that people will start talking about you. Don't miss out on opportunities that gives you valuable exposure. This includes being interviewed and speak in events. Make sure that you own first page of search engine results or information that gets posted about you. Last year, I spoke on the same event where my talk was focused on Philippine E-Commerce Entrepreneurs Towards Globalization. Great to see Pangasinan SEO bloggers Dr. Julius Mamaril, Philip Tiangson, and Julius Sison once again whose presentations proved that regardless of location, one can make money online. First met these guys during the Search Engine Marketing & Optimization seminar at Urdaneta City University last year. Carlo Ople gave an inspiring talk on how to make money online and shared his experience on how he was able build it gradually. I am also thankful for the "Champion of Philippine Internet and E-Commerce Hall of Fame Award" recognition "for offering all her life towards the advancement of E-Commerce and Digital Media education and policy improvement in the Philippines". Look forward interacting with AIE College students. Have fun in your blogging adventure!